A No. 69 leaf decorating tip from Wilton, use to make realistic flower petals, dramatic ruffles, drapes, swags and bows. Use with the standard coupler. 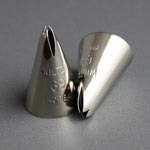 Feedback for WILTON No.69 Leaf Decorating Tip (1) has been compiled from 0 reviews.